Sharing the road with 80,000-pound semi-trucks, big-rigs and 18-wheelers can be intimidating—even under the best of circumstances. Due to the massive size and weight, these commercial trucks can practically demolish smaller, lighter weight passenger vehicles in a collision, causing catastrophic injuries and even death. Drunk driving truck accidents are particularly tragic and infuriating, as they almost certainly could have been prevented. The dangers associated with drunk driving are hardly a mystery—both federal and private safety groups have spent decades raising awareness of the risks of driving under the influence of alcohol. Commercial drivers who get behind the wheel after drinking knowingly and willingly put others in jeopardy. Fortunately, Delaware law allows those harmed in truck accidents caused by negligent, intoxicated truckers to pursue compensation for their injuries. If you are considering taking legal action after being injured in a drunk driving truck accident, here's what you need to know. In 2015, 10,265 people were killed in vehicle accidents involving alcohol-impaired drivers; this breaks down to approximately one alcohol-related accident death every 51 minutes. Alcohol-related fatalities accounted for nearly 30 percent of all motor vehicle fatalities in 2015. Drunk driving accident fatalities rose 3.2 percent from 2014 to 2015—from 9,943 to 10,265, respectively. Two percent of commercial truck drivers involved in fatal crashes in 2015 had a blood alcohol concentration (BAC) of .08 g/dL or higher. Because large commercial trucks can be so dangerous in an accident, truck drivers must be qualified and extremely well-trained. In the interest of public safety, they are also held to a stricter standard than non-commercial drivers when it comes to alcohol consumption. The Federal Motor Carrier Safety Administration (FMCSA), which is the federal agency that regulates the commercial trucking industry for safety, sets the threshold for intoxication for commercial drivers at .04 percent BAC. This is half the national standard for intoxication for non-commercial drivers, which is .08 percent BAC. Additionally, FMCSA rules prohibit truck drivers from getting behind the wheel within four hours of consuming alcoholic beverages. To ensure compliance with the FMCSA's alcohol-related safety rules, trucking companies can test their employees for drug and alcohol use when they first hire them, and whenever they have reason to believe that an employee could be under the influence. 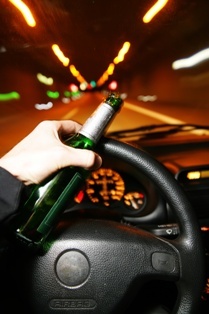 If an employee refuses a test to gauge their BAC, that can be considered an admission of intoxication. For commercial truck drivers who violate FMCSA rules, the penalties can be steep. These truckers may face a suspension of their commercial driver's license (CDL), as well as criminal penalties for driving while intoxicated. If you sustained serious injuries in a truck accident caused by a drunk commercial truck driver, you may be entitled to compensation for a wide range of damages, including past and ongoing medical expenses, lost wages, loss of earning potential, pain and suffering, mental anguish, and more. The experienced truck accident attorneys at the Morris James Personal Injury Group can help you pursue the compensation and justice you deserve. Contact the Morris James Personal Injury Group today to schedule a free initial consultation to discuss the details of your truck accident case with a legal professional.